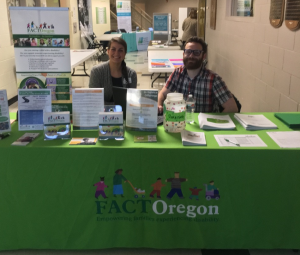 ‘Higher-education, work and independent living are the reasons we all attend(ed) school, and it is no different for a student with a disability’, was the reoccurring theme throughout the one-day regional conference led by FACT Oregon (Families and Communities Together) in Rockaway Beach. Paul Erlebach, Superintendent of the Neah-Kah-Nie School District, opened the morning by welcoming parents, professionals and vendors and calling out that disability is natural. Caitlin Shockley, from FACT Oregon, followed with an introduction saying, “We do not need to keep trying to fix a person with a disability, there is nothing to ‘fix’, what we need to do is make sure students are creating relationships and experiences that make life meaningful and we do this by allowing them to participate alongside their peers – it is good for everyone”. Nearly 50 people attended from as far as Astoria and South Tillamook County to capture information regarding topics such as how to navigate an Individualized Education Program (IEP), Assistive Technology as Support, Transition to Kindergarten and Launch into Adulthood. While enjoying lunch catered by Offshore Grill of Rockaway Beach, nearly 20 vendors showed off the services they provide within the North Coast region for the those who experience disability and their families. Celebrate Inclusive School Week December 3-7, 2018! Enjoy this charming short video of Garrett’s inclusive experience by Dan Habib, Intelligent Lives: Garrett Shows I’m in Charge.